Note: This is an amazing ingredient combo. If you can't make the pizza dough to have a 12 inch diameter (which is quite large), then adjust the amount of ingredients you put on the pizza. If you happen to get a hole in the bottom of your crust when handling it (rolling it out), don't worry, just let it be (when the pizza bakes, it won't be a problem). Use your judgement - the most definite thing is to make sure the pizza stone is VERY HOT and to cook it at 500 degrees! YUM YUM! In a small skillet, heat oil over low heat. Add onions, salt, pepper and balsamic vinegar and cook over low heat for about 45 minutes. Do not let the onions brown, just slow cook them, until caramelized. Preheat oven to 500 degrees, with baking stone inside, on the lowest rack for 1 hour. The bottom of the pizza won't crisp and will stick if the stone isn't hot enough. With the rolled out pizza dough on the pizza paddle, brush on a light layer of olive oil (do not saturate it). Sprinkle the dough with garlic. Cover with a layer of the caramelized onions. Sprinkle on the mozarella cheese, then the gruyere. Then top the mushrooms and the blue cheese. Sprinkle on salt and fresh pepper. Carefully, transfer the pizza from the paddle by tipping and sliding it gently to the heated baking stone. Bake for 10-12 minutes or until crisp on the bottom and golden on the top. Remove from oven and let cool for 3-5 minutes. 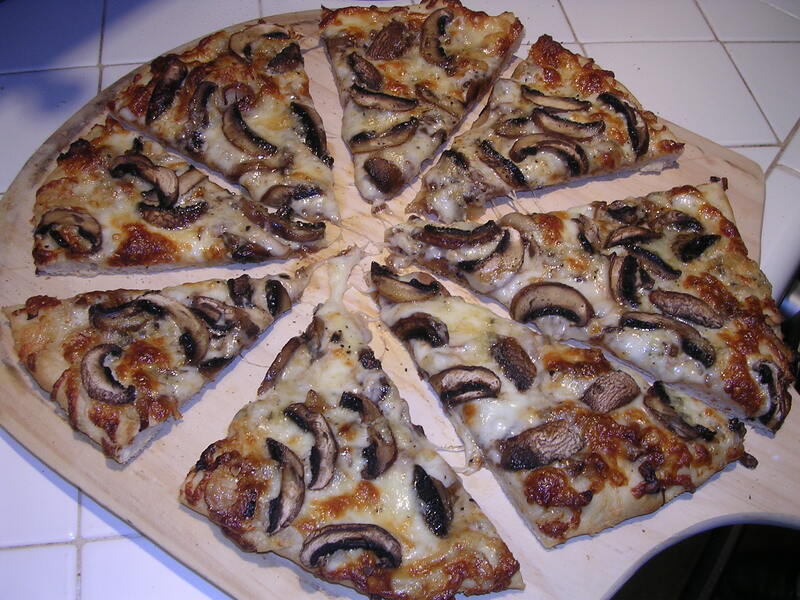 Cut using a pizza cutter or sharp knife. Serve.